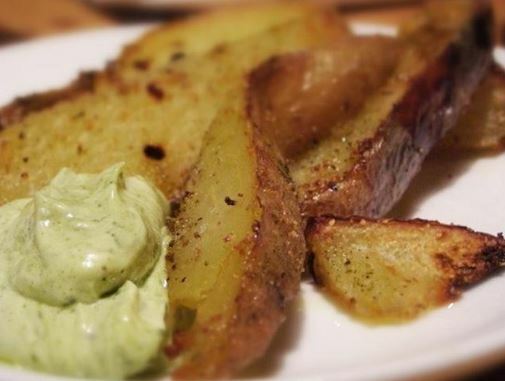 Baked potato wedges with pesto dip: Americans often use what is known as a coating or ‘Rub’ on meat and fish. These ‘rubs’ are a combination of herbs and spices that are applied to enhance flavour. 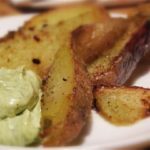 It is similar to that found on American chips so we applied the same technique to our baked potato wedges with pesto dip with wonderful results! While we are using our oven, we like to make use of all that energy so as not to waste a drop of it, by filling the oven with as much as we can. In many cases, this means cooking up a batch of baked potatoes. 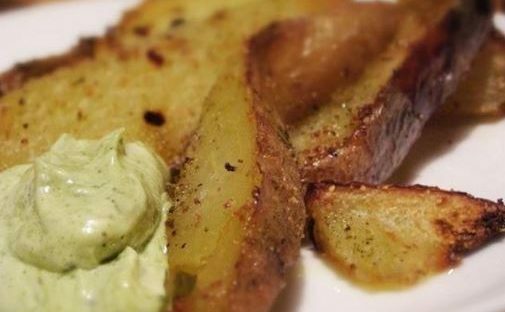 We keep the cooked potatoes in the fridge for a couple of days and then use them to make our baked potato wedges with pesto sauce. It is the perfect finger food! As well as our homemade pasta, our baked potatoes wedges with pesto dip, have proven to be very popular on the dinner table here at The Big Dream Factory and we hope you like it too! Preheat the oven to 385F / 195C. With a sharp knife, cut along the length of each potatoes to form 6-8 big slices. Toss the potato slices in olive oil, salt and spices. Place the potatoes on a baking sheet in single layer. Place in the center of the oven for about 30 – 45 minutes, turning occasionally until the potatoes brown and turn slightly crispy around the edges. Meanwhile, make the pesto dip. Serve warm potatoes with the pesto dip. Add some sparkling conversation and a couple of beers then enjoy! English Pancakes: It’s Pancake Day!